As the director of the IB and AP programs I am honored to have the opportunity to assist your children in shaping and realizing their academic dreams. Their academic and social success is the best reward for every educator at ACS Athens and this is what guides and motivates all of us to work hard in order to provide the best educational experience to our students. ACS Athens, committed in providing a Harmonious, Meaningful and Holistic education, offers a variety of academic programs such that students will best achieve their full potential. The IB Diploma program, the AP program, the IB certificate courses are all nested within our school’s Academy. This gives the opportunity to all students to choose the program that best fits their abilities and college plans. 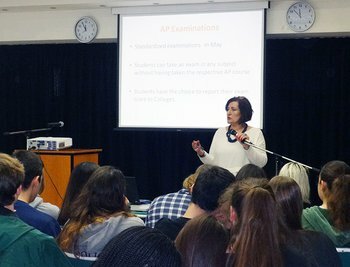 Students opting for the ACS High School Diploma in conjunction with any of the programs mentioned above may choose from a wide variety of IB and AP courses offered in order to create their unique student profile that will lead them to academic success. Alignment with all functional areas of our school ensures that students are supported in their course selection by a number of committed and experienced counselors. Following our philosophy of providing a holistic education, the entrance criteria and eligibility to take any of the IB, AP courses are not solely based on performance criteria, but also include teacher recommendations and a holistic review of the student profile. While we are operating within the guidelines and requirements of both IBO and College Board in offering these programs, we also want to make sure that the delivery of these programs is consistent with our mission statement. Thus, guided by our American philosophy of education we offer a student-centered education and a teaching environment that enables our experienced IB and AP faculty to explore and applying innovation in education at all different levels: creating innovative courses, applying innovative teaching strategies, being involved in innovative projects, or using technology efficiently to enhance in and out of classroom learning. Given the wide variety of programs and your valuable cooperation, I believe that we can succeed in challenging students academically in order to reach their fullest potential; and we can succeed in promoting and instilling social and ethical values such that all of our students can thrive as responsible global citizens in the 21st Century.